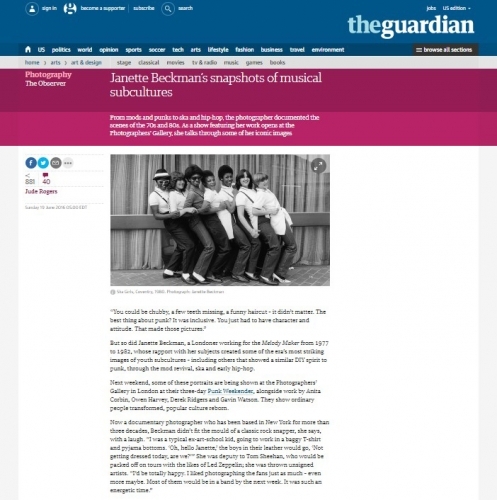 But so did Janette Beckman, a Londoner working for the Melody Maker from 1977 to 1982, whose rapport with her subjects created some of the era’s most striking images of youth subcultures – including others that showed a similar DIY spirit to punk, through the mod revival, ska and early hip-hop. Next weekend, some of these portraits are being shown at the Photographers’ Gallery in London at their three-day Punk Weekender, alongside work by Anita Corbin, Owen Harvey, Derek Ridgers and Gavin Watson. They show ordinary people transformed, popular culture reborn.